One of the best parts of the PowerShell community culture is the willingness of people at all levels of expertise to help others to learn. It acknowledges that we learn from each other all the time and pays backward and forward for help that others have given to us. So, there are many people giving talks and presentations about PowerShell. And, PowerShell Studio has several features that make presentations easier. Filegroups: Open all scripts and modules for your presentation in a single click, even if the code files are on different machines in different locations. The files open in PowerShell studio in the order that you specify. No more fumbling at presentation time; no more delays during practice.The process does not change the script files, so it doesn’t invalidate testing or jeopardize demos. For information about filegroups, see a demo video: FileGroups in PowerShell Studio. Pin to Recent Documents: Beginning in PowerShell Studio 5.2.117, you can pin files to the Recent Documents list in PowerShell Studio. You can pin your filegroup file and any other files you need so they’re available quickly during your presentation. 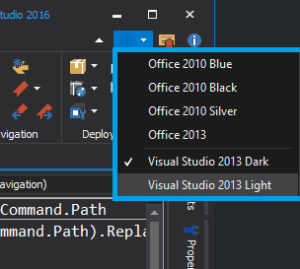 Quick-switch themes: It’s easy to change the theme of your PowerShell Studio display. If you prefer one theme, but it’s not optimal for presentation mode, switch it. And when the presentation ends, switch it right back. To change the theme, use the drop-down menu in the top right corner of the PowerShell Studio window. Font slider: The font slider lets you adjust the font size in the Editor pane dynamically to optimize it for the audience. 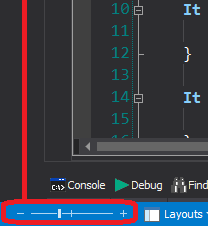 The font slider is in the lower left corner of the PowerShell Studio window. Layouts: A layout is an arrangement of panes in a PowerShell Studio window. You can use the preset layouts or use the Save Layout feature to create custom layouts.I often use a custom layout to simplify my window during presentations. But, more often, I just change the Auto-Layout settings (Home\Windows\Options\Panels\AutoLayout) to those that are best for my presentation. For example, I change the Editor Layout to Editor Only Layout. Copy HTML: After my talk, when I’m working on a follow-up blog, it’s easy to copy my code from PowerShell Studio — with the formatting and syntax coloring — and paste it into my blogger. Select the code, right-click, and then click Copy HTML. These few tricks make my presentations much smoother and allow me to focus on the content. Do you have tricks I haven’t listed? Use the comments to let me know and I’ll add them to this post. @MrBoDean @SAPIENTech Good luck, Jon! If I’ve missed any features, let me know. Everyone presents differently.